Anne Hathaway wearing an aquamarine gown. It's halfway through March and we're still thinking about the gorgeous color aquamarine that those born in the month of March are lucky enough to have as their birthstone. It is one of those colors that just looks serene and calm, and reminds us of those tropical vacations where laying in the warm sand is the most strenuous activity of the day. 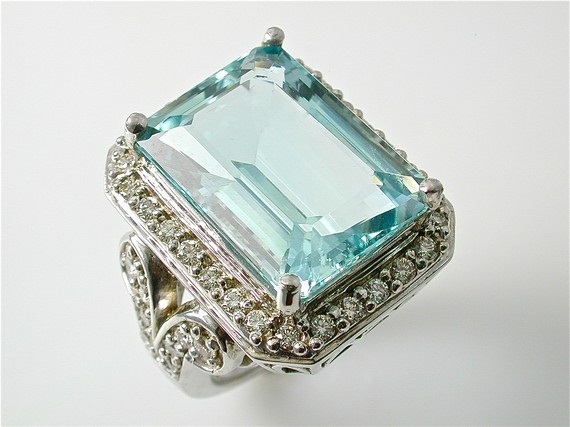 There are many shades of aquamarine, from very light blue to dark blue and can include stones with shades of green as well. We love our line of "Something Blue" items that contain all shades of aquamarine. Not only is it a gorgeous wedding color, but can fulfill the wedding tradition of "something blue" on the bride's big day. Using blue in something small, like a garter or bouquet embellishment, or more lavishly, like the bridesmaid's dresses, adds a beautiful touch to any wedding. 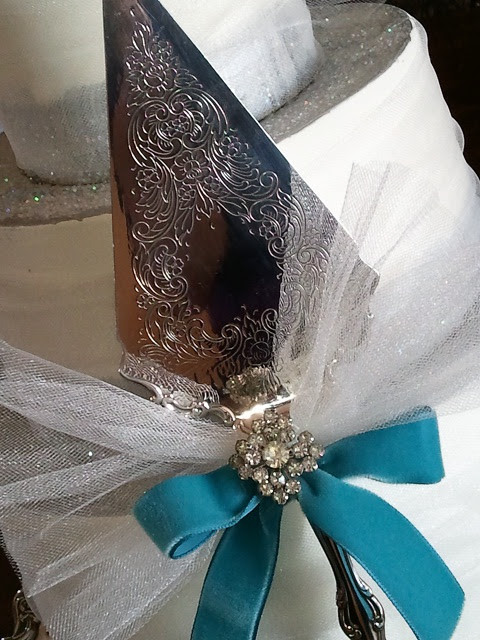 We love our vintage cake server shown below, with the blue velvet ribbon. How about you? Lovely vintage ring found on Etsy. Vintage cake server by Twice Loved Vintage.